It is hot and humid. I am in a natural reserve near the heart of Brisbane, Queensland. I walk up to the J.C. Slaughter waterfalls. There are only rocks. The river is dry. 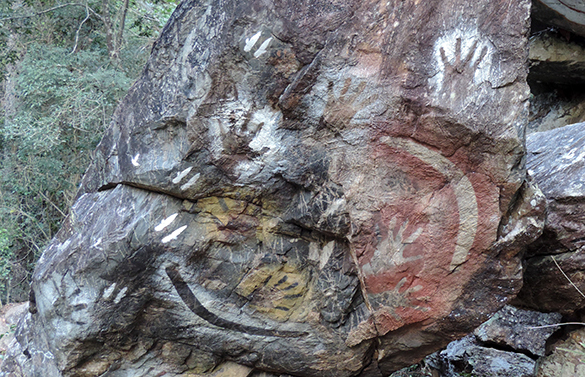 A sign indicates “Aboriginal Art”. A small plaque tells me that these rock paintings from 1993 celebrate the International Year of the World’s Indigenous People and that the aboriginal artists are Laurie Nilsen, Marshall Bell, Laurie Graham and Mark Garlett. 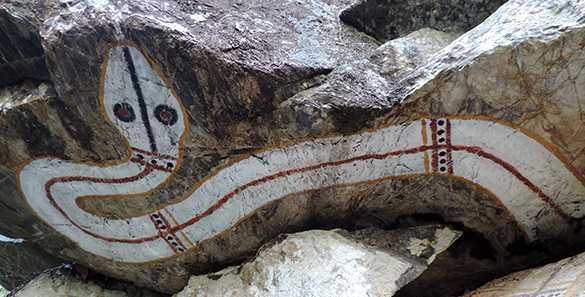 Blow-painting – with dyes spat from the mouth – was a prominent feature of aboriginal painting. 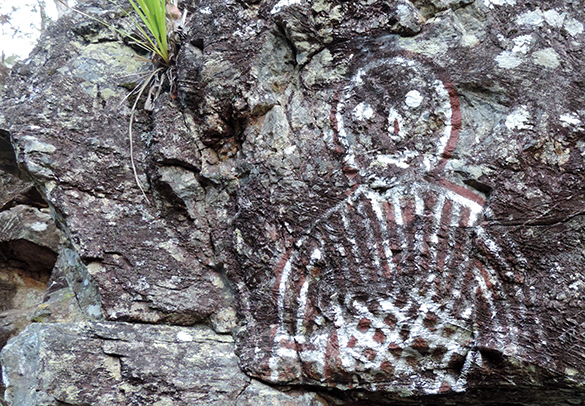 Hands and hunting boomerangs were frequently used as stencils. Here, the paintings include, in white, macropod (e.g. kangaroo) tracks. The works have an instant and earthy appeal. I find them beautiful. They take me closer to an ancient culture born of a harsh environment. A fabulous serpentine form uncoils itself from under the over-hanging rock. I guess snakes feature so prominently in aboriginal folklore because, even today, they represent the greatest danger for anyone who goes walkabout. Despite the fact that these paintings are only twenty-two years old, I accept that they are “aboriginal.” They represent creative impulses of people who were the owners and custodians of this parched land for thousands of years before Captain Cook sailed into Botany Bay and the painters are, I assume, descended from these people. As I walk back down the dusty track, a young woman jogs past; she wears Nike shoes, a pink lycra top and an iPhone strapped to her left upper arm. I reflect on the dual and incomparable stories of humanity’s existence on this huge dry continent. A kookaburra cackles its laugh at me. I have a feeling that the bird is ridiculing my attempt to understand what these paintings really mean for aborigine people. But then, maybe it is just telling me to go away. 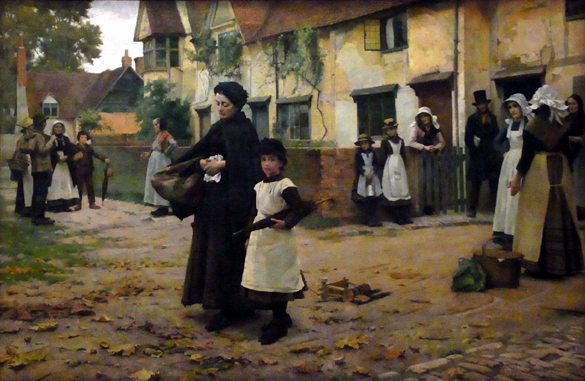 “Evicted” by Blandford Fletcher, 1887 Oil on canvas. Photo taken thanks to Queensland Art Gallery, South Bank, Brisbane, Queensland. 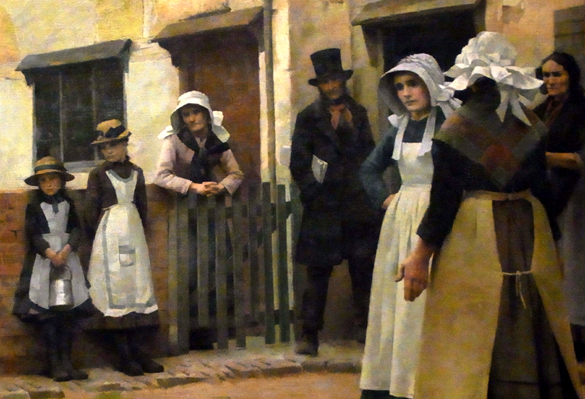 Each visit to the Queensland Art Gallery sees me inexorably drawn to “Evicted” by Blandford Fletcher (1858 -1936). I question why this should be. 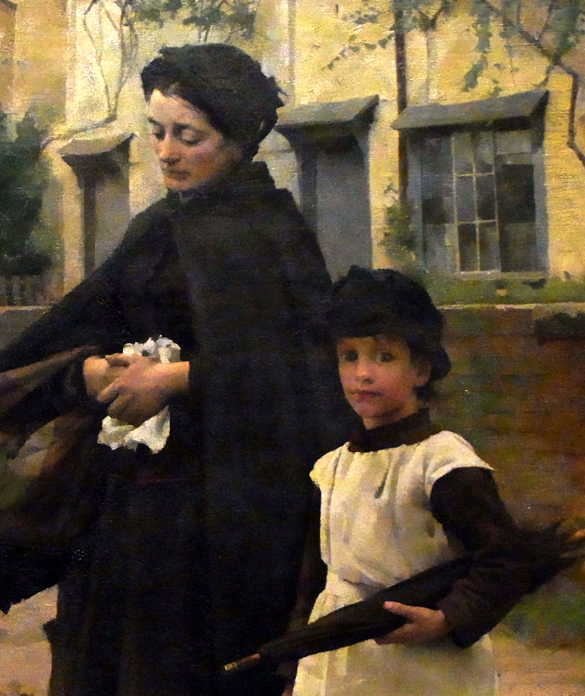 Is it that this painting from 1887 reminds me of my past life living in English villages, thus stirring emotive memories? Is it that it brings me closer to my ancestors who lived in Britain and would have dressed like this and known the world that it portrays? The words ‘appealed to the social conscience’ were the key. This was the missing layer, the hidden extra, the further dimension that this painting offered. It was painted for a reason above and beyond the artist’s need to recreate that which appealed to his aesthetic senses. It was a statement designed to initiate change and I saw parallels with the songs of John Lennon, the writings of Harriet Beecher Stowe and all the works of ‘artists’ throughout the ages who have highlighted the suffering and injustices in society and on occasions offered solutions. This made me further think about the ‘artist’s’ role in initiating social change. I feel that simply because of what artists do their views in this arena are seen and heard most readily, stridently and often in extraordinarily attractive and powerful ways. This, I think, has resulted in society giving an unjustified importance to artists’ opinions and therefore granting them a licence, bordering on a monopoly, over the regulation of the social conscience. If this is true then it is a complete fallacy. We all must be and can be guardians of the social conscience and initiate social change by using whatever medium we are skilled at using. Michael Parekowhai‘s bronze is a life-sized Indian Elephant apparently standing on its head with its feet attached to a rock. 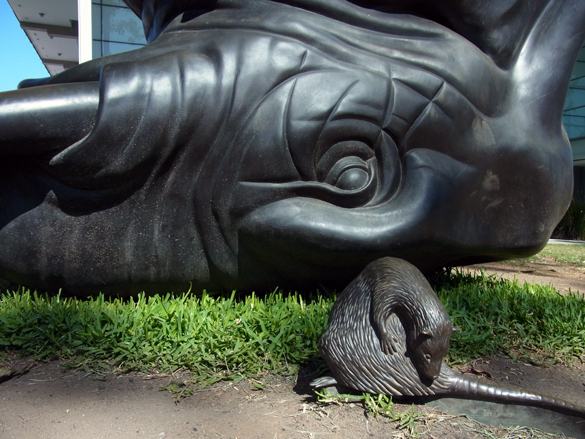 Beside it, easily overlooked, is a life-sized, Australian, Native Water Rat grooming its bronze fur. The work stands on the South Bank of the Brisbane River outside the Art Gallery. The Elephant is smooth to touch, unlike a real Elephant and I find it a pleasant sensation to run my hands over the wonderful folds in its skin. Both animals are portrayed in an extremely accurate way, which for me, is the most important thing about any work. I am attracted to realistic sculptures in that I appreciate the skill involved. This may seem strange coming from a cartoonist. 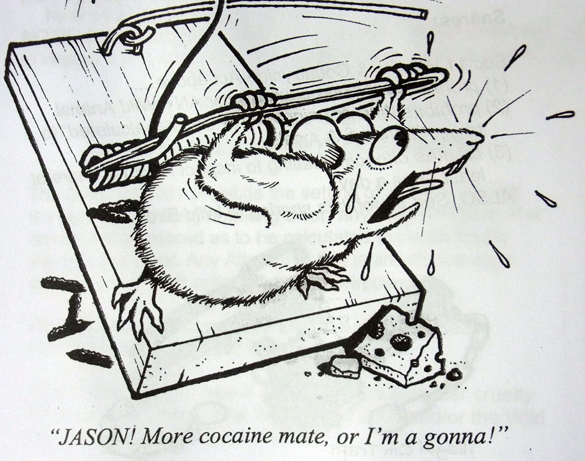 (We asked Garth for cartoon examples of these animals and he sent us two he had used to illustrate an article on the law concerning trapping of animals – see below!) 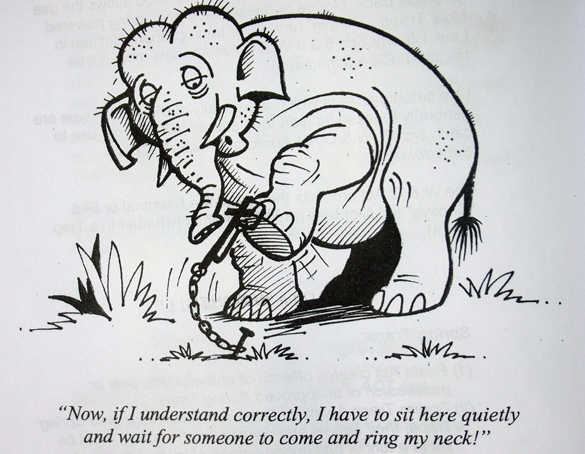 The Elephant’s massive strength is somehow accentuated by the way it is pushing back on the rock to prevent itself being turned on its back. The Rat’s fussy grooming is typically rodentious – now there’s a new word for the dictionary! So I find myself liking this unusual work very much. I walk around it and realise that its placement with the background of the impressive Brisbane skyline adds greatly to my enjoyment. Then I read about the sculpture. 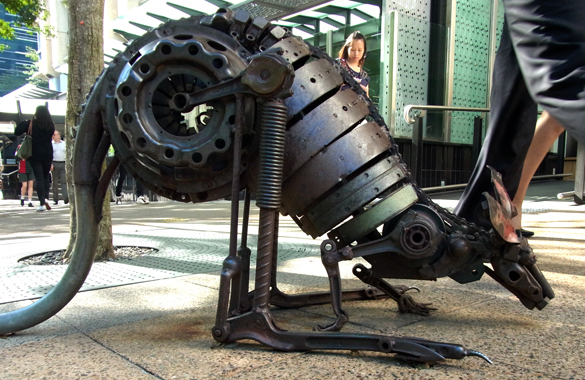 “The World Turns” was commissioned by the Queensland Government in 2011. The descriptive plaque tells us that the Native Rat is a hero, a traditional caretaker, together with the Native People, of the Mangroves at Kurilpa point where the Gallery stands. This initially seems to give some geographical meaning to the work. It continues by telling us that the Rat goes about his business even though he has shifted the World, as represented by the Elephant and rock, from its axis. Oh! Dear! I am becoming confused! Not hard to do, I know, but I don’t like it. I read on about how the work “reminds us that history is often recorded to highlight specific moments, but, as the world turns, there are many other stories – and these are central to our understanding of history”. Now I am truly confused! Obscure and multiple meanings, poorly written, do not serve this wonderful work well in my opinion. I walk away, annoyed that what I consider to be pretentious “art speak” has spoilt my complete enjoyment of the sculpture. This situation forces me to think about which is ultimately the more important, the work or the idea that drove its creation. I know that the two cannot exist without each other and the question is a difficult one. I try to find an analogy or parallel to clarify my thinking. I find it in poetry, where I am sure that any idea is given more power by words that intelligently and beautifully rhyme rather than simply being written down? Therefore the work is the greater of the two, ultimately speaking to us of its own beauty in spite of the idea that spawned it. 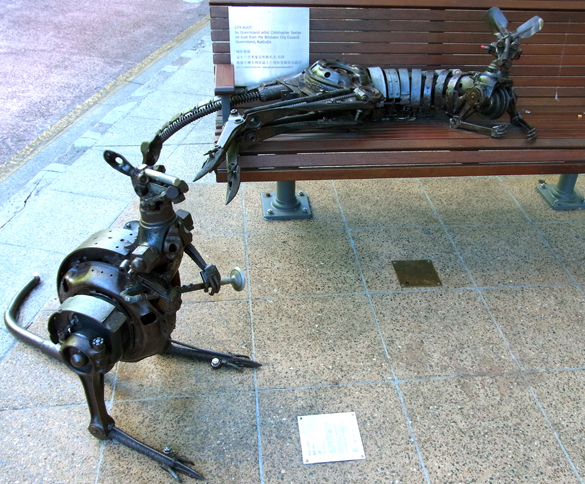 Since discovering Christopher Trotter‘s ‘City Roos’ on George Street, Brisbane, I have wondered how this sculptural installation has escaped the machinations of the Health and Safety officials and avoided immediate removal as a hazard to pedestrians who might trip over them. 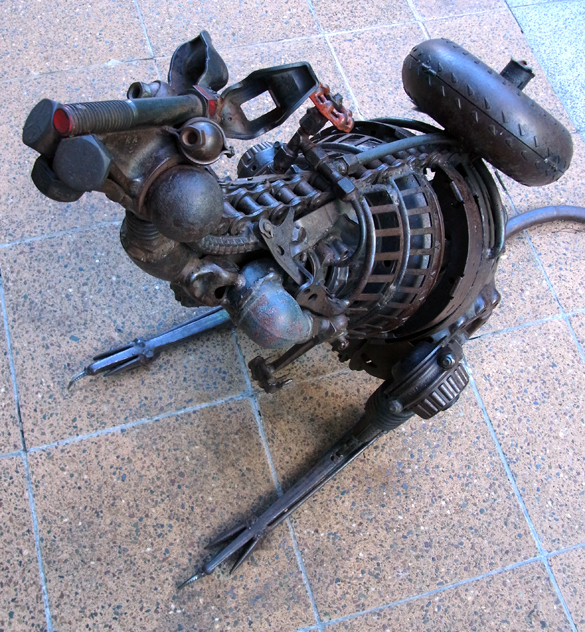 Four kangaroos, constructed of scrap, congregate on the pavement. One feeds, two are attentive to you, hoping for a snack perhaps, and one lounges on a seat with his steel scrotum catching the sun. This is how they are if you wander amongst them at a zoo and it is this accurate portrayal of character as well as form and pose that attracts me. A kinetic effect is remarkably achieved as folk walk by, ignoring the ferrous Macropods, or giving them attention when smiles are the most frequent expressions generated. This is wonderful to behold and adds to the enjoyment of the ‘City Roo’ experience! We could all do with smiling more! I also spend time finding additional interest in the shapes of the scrap and guessing the scrap’s origin and former function. In my opinion ‘City Roos’ (1999) are imaginative, well executed and thoughtfully placed in their concrete and neon, skyscraper habitat. I find no obvious message here but I would bet that Mr Trotter and the Brisbane City Council, who own the work, are stating Australian pride, indulging in some Australian humour and deliberately adding to the wonderful, urban environment that this city offers. I was watching Cormorants fishing at the point where muddy Oxley Creek meets the muddy Brisbane River in Queensland, Australia, when I came across a strange sculpture. Oxley Creek, near the junction with the Brisbane river. 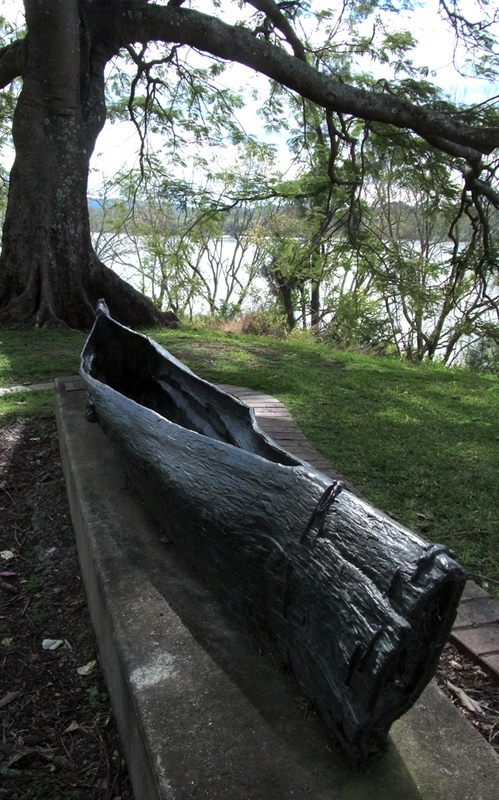 The Oxley Creek Bark Canoe. 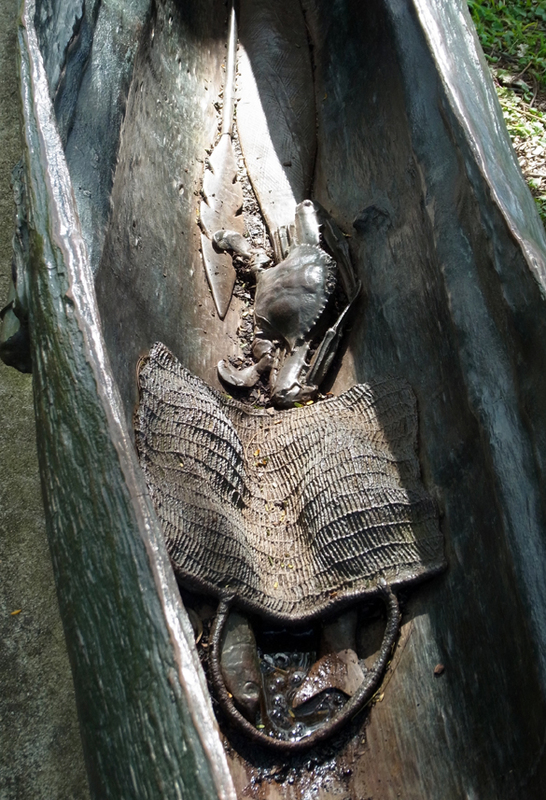 This is a bronze which apparently is a facsimile of an Aboriginal, bark canoe that was built to ‘acknowledge the Jagara people‘s use of Oxley Creek’ as part of the ‘First Oxley Creek Water Festival’ in 1997. 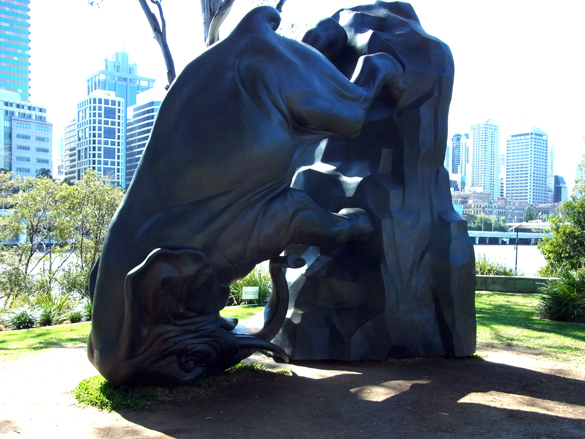 Brisbane City Council then commissioned sculptor Sean Tapner to create the Bronze at lifesize. I felt it, tapped it and looked at it. The second thought I had, after one of admiration for the sculptor’s skill, was that if this were in the UK it would have been stolen at worst or vandalised at best. In fact it would not even have been placed in a small, suburban park on a riverbank like this for those reasons. But here it was, sixteen years on, untouched and flawless. … and in the canoe! The canoe’s edges curl inward and I imagined how precarious I would feel sitting in it. I imagined those edges cutting into my bare skin as I paddled. I imagined the smell of fresh fish, mud and sweat; for lying in the bottom of the canoe, as if the Jagara had just hauled it up the muddy bank, is the catch of Mullet and a Blue Swimming Crab, a woven basket, a fish spear and a decorated paddle. And that’s it. Simply a realistic rendering of everyday objects. A still life? No obvious message or meaning. A council funded sculpture surrounded by Council barbecue points and some children’s swings to commemorate, in some way, a Council funded festival. But this thing was speaking to me. It forced its way into my consciousness demanding me to think deeply about it. This canoe and its contents were resonating with rythms of an unchanging lifestyle from thousands of years ago. It spoke also of white, European, national guilt and the hypocrisy of those who believe that an ‘acknowledgement’ is atonement enough for Manifest Destiny, whilst Aboriginal peoples still suffer the legacy of it. These were natural objects because they were from a time and a culture that did not separate Man from the ‘Natural World’. Their ‘beauty’ was in their efficient functionality. Handmade, utilitarian objects, their meaning and their use the difference between life and death. No wonder it resonated. It was only when I recognised the effect that the bronze had on me that I thought it might be a suitable subject for Talking Beautiful Stuff.